BOOK YOUR EL DORADO ROYALE RESORT VACATION ONLINE TODAY! Laid Back Luxury! Vacation in Paradise. El Dorado Royale Welcome to laid back l uxury for adults. 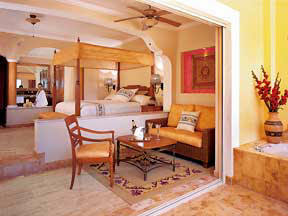 At El Dorado Royale they take the traditional Mexican saying "Mi Casa Es Su Casa" quite literally. It is how they define their way of thinking, service and hospitality. This casually elegant, adults-only beach front resort offers a unique setting for a romantic and relaxing getaway. It is the perfect destination whether you are honeymooning or just looking for a place to enjoy each other and unwind. 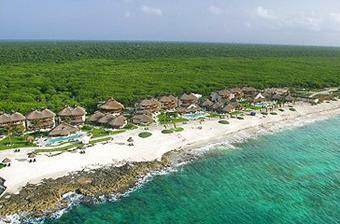 The El Dorado Royale is an adults only paradise located in the heart of the Riviera Maya facing Mexican Caribbean. The El Dorado Royale is a deluxe property ideal for vacationers seeking laid-back luxury for adults. From the moment you step on to the property you will experience the signature service of El Dorado Royale. Before checking in you will be greeted by the staff and welcomed with a complimentary glass of champagne. After checking in one of the staff members will accompany you to your Junior Suite or Casita Suite and along the way show you the main highlights of the resort. This is a secluded deluxe all inclusive SPA resort for adults only, built on 450 acres of tropical jungle on over a mile of unspoiled Punta Brava Beach, spread among coconut palm trees. “Hot tubs and Hammocks” is how one guest summarized the atmosphere at El Dorado Royale. Rest, relaxation and romance is our motto and it was weaved into every aspect of the property including the suites, as this is an all suite resort. The decoration of its 385 Junior Suites was inspired by local Mexican motifs, providing for a wonderfully balanced atmosphere. Each of the suites has indoor Jacuzzis so you can extend your soaking pleasure into the privacy of your accommodations. All rooms feature lovely wooden furniture including king size or double beds, nightstands, and desk. To cool down from the warm tropical breeze, each room has individually controlled air conditioning and a ceiling fan. Other conveniences include a radio and alarm clock, safety deposit box, private bath or shower, color satellite TV, amenity kit, ironing board with iron, minibar and coffee maker. Finally, every terrace brings chairs and a hammock…there is nothing quite as relaxing as being swung softly by a gentle on-shore breeze. All suites provide beautiful views of the gardens and lush foliage. Enjoy unobstructed views of the Mexican Caribbean. For those who crave closeness to the sea, these are the perfect choice. Just a few steps away from the beautiful beach and all with lovely views of the Mexican Caribbean. 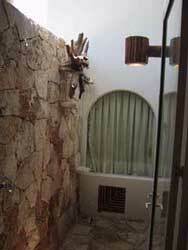 The Casita suites comprise a separate, secluded area of the hotel. They are distributed among one or two story buildings and are uniquely designed combining elements of luxury, space and local craftsmanship. Enjoy all the features of the Casita suite and step directly into a lazy river that connects to the main pool with swim up bar. Along with all the standard furnishings, the Casita suites feature high ceilings with a thatched roof, double sink, full bath and shower, an ocean view indoor Jacuzzi, an oversized balcony with breathtaking views of the Caribbean and a DVD player with a selection of some DVD's. We know that there will be days or special occasions when you will not feel like visiting one of the restaurants. For those special moments we have a 24-hour room service available (please see restaurant section for room-service menu). In the room, a refrigerator is stocked and replenished daily with water, soft drinks and beer. Lastly, perhaps the most unique and popular attribute of the Casita suites is the open air shower, which we call Aguas del Amor. It is truly an inspiring experience to take a moonlit shower under the stars. Regardless, however, of which room-type you select, we promise that your stay will be as comfortable and pleasant as we can possibly make it. Of course, non–smoking rooms are available upon request. While El Dorado Royale is famous for rest and relaxation, they also offer a variety of fun activities and entertainment throughout the day and at night. This way you have a choice and truly enjoy the best of both worlds…you can relax in your hammock with a book, take a peaceful stroll down the beach or spend a romantic afternoon with your loved one. Or if you prefer, you can participate in any or all of the activities that are available from eight o’ clock in the morning until the evening hours. 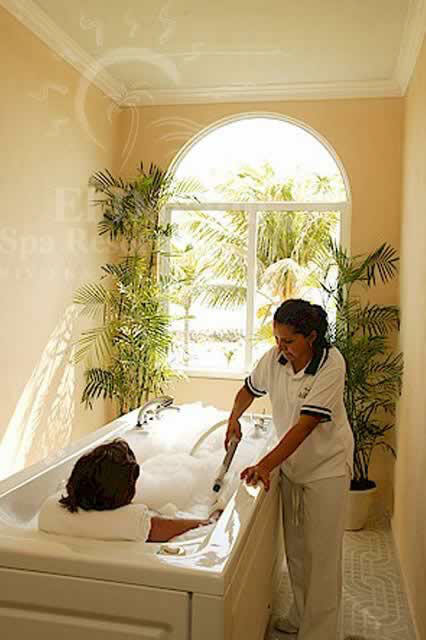 The Spa at El Dorado Royale offers an assortment of treatments for the body and soul. Located in the center of the property, the El Dorado Royale spa was created with the same motto of rest, relaxation and romance. Among the many treatments, one of our most popular offerings is the couples massage class. Use of the spa facilities includes the fitness room, sauna, steam room, pressure shower, Jacuzzi, spa pool and lockers. Pleasing the Palate The variety and quality of food at El Dorado Royale is one of the main factors that will make your vacation special and memorable. 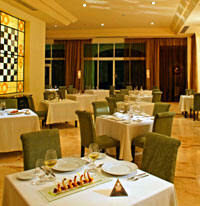 The property offers dining in five distinctive a la carte restaurants. You may choose between international cuisine at the main restaurant La Isla, Italian fare at La Fontana, Gourmet Mexican at La Carreta, creative pan-Asian dishes at Kampai or specially prepared meals at the Beach Club. 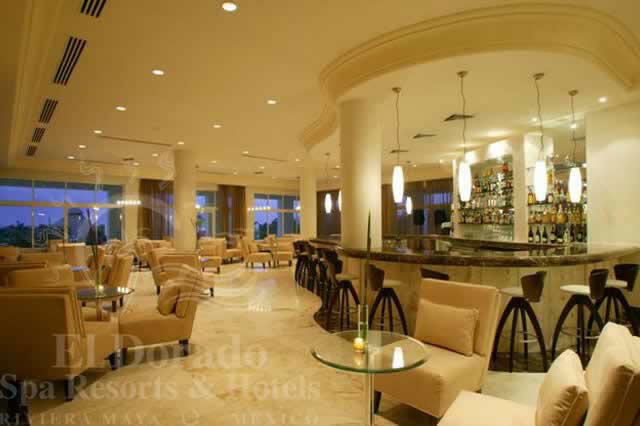 Bountiful bars At El Dorado Royale you have a choice between eight different bars. However, the bars are not just bars, they all have a certain twist providing for an ideal atmosphere for lounging, socializing or just plain fun. Whether you are looking for a secluded romantic spot to enjoy a luscious drink with your loved one, or are looking for a popular spot to make new friends, one of the six bars will surely satisfy your needs. At the disco, which is a huge palapa, you can enjoy nightly entertaining as well as dance music. If you are more the quiet type, join in a conversation with other guests at the relaxing La Guacamayas Bar and enjoy a wide variety of cocktails. Elegant air conditioned main restaurant with additional outdoor dining opportunities. Serving breakfast from 6:30 - 11:00am, Brunch from 11:00 am – 3:30 pm Saturdays & Sundays only, and dinner from 5:30 – 10:00 pm. Chefs menù changed daily. A la carte International Cuisine. Open air Palapa restaurant. Features continental breakfast from 6:00 – 7:00 am and international breakfast from 7:00 - 11:00 am, lunch 12.00pm-3.30pm. Authentic Mexican Cuisine. Open for dinner a la carte. Open from 5.30 pm -10.00pm. Reservation required. None smoking restaurant. Contemporary Italian Cuisine. Open for dinner from 5.30 pm - 10.00pm. Air conditioned and outdoor dining opportunities. Reservation required. None smoking restaurant. Fine oriental Cuisine. Outdoor dining. Open for dinner from 5.30pm - 10.00pm. Reservation required. Smoking and none smoking section. JO JO’S CARIBBEAN SEASIDE GRILL. Lunch services and afternoon grills. Lunch served from 11:00am - 4:00 pm. Caribbean delights served from 7:00 pm - 10:00 pm. Reservation required. Wood oven pizzas served to order with your choice of toppings, and a selection of angus burgers, Kosher hot dogs and freshly tossed Caesar salad. Room service is available 24 hours. A la carte restaurants require reservations; dress code is semi formal pants or bermudas, t-shirts with sleeves, closed-toe shoes for men.